Creating a secure, comfortable space, the Carlson Intermediate Double Door Dog Crate provides a relaxing environment for your pet. Built to be simple, yet secure, the dog crate features two doors, one at the front and one at the side of the crate. 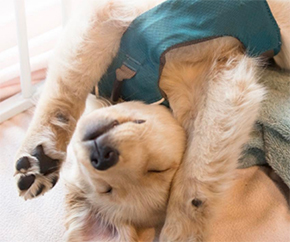 The multi-point locking system, secures your pet and provides owners with peace of mind. Perfect for intermediate breeds up to 30” long and up to 23” tall, the Double Door Dog Crate can be used from puppy to adult stage. Both functional and convenient, the Carlson Intermediate Double Door Dog Crate is built with an all steel wire frame and a multi-point locking system for added security. 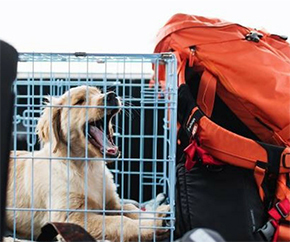 The portable dog crate, collapses nearly flat and sets up in minutes. Once latched, the crate is easily carried and is compact enough to store in a variety of spaces. Measuring 36” L x 23” W x 25” H, the crate provides a comfortable environment for intermediate sized breeds. Having the front and side access doors, provide the crate with versatility and easy access to the inside of the crate. And if you’re using it to train a puppy, the wire crate features a removable bottom pan, so it’s easy to clean if accidents do occur. 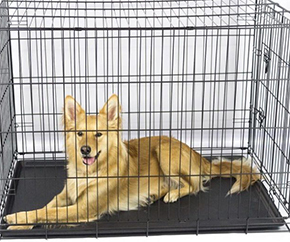 The Carlson Intermediate Double Door Dog Crate is backed by a manufacturer’s limited 90-day warranty. Carlson Pets Products are designed specifically for your pet to suit all breeds and lifestyles.